Rieneke Schutte spent most of her 20’s, 30’s and 40’s raising her children and selling Tupperware. Her aim was to sell Tupperware while at home with her children with the view to getting a ‘real job’ when they were a little bigger. However, her direct selling business grew until she became a team manager, responsible for selling and training up others, earning her a good salary for 21 years. Selling and working with the same product for 21 years eventually became somewhat boring, with few challenges left to overcome, so Rieneke decided to start her own business from home, but none of the ideas became a success. After her youngest child left home Rieneke suffered from ‘empty nest syndrome’ and she knew she needed to do something about it. She had always been interested in and involved in some way with community work and she felt she wanted to get more involved and give back to her local community in Pretoria. In 1997 Rieneke started helping out at a local pre-school for under-privileged children called Pennies Nursery School as a volunteer. Since then her involvement with pre-school education in the city of Tshwane has developed into a fulltime career. Rieneke works as a programme manager for PEN (Participate, Empower and Navigate), a faith-based organisation operating in the city of Tshwane. At the moment PEN runs 2 nursery schools. Pennies Nursery School caters for 100 underprivileged pre-school children up to Grade R level. Each class of 20 children has one qualified teacher. There is also a fully-equipped therapy room and a toy library. Sun Sparrows Nursery School was started 8 years ago and caters for 80 little ones from babies to pre-school age in the Sunnyside area. The need to educate and care for young children in Tshwane is bigger than any one organisation can take on and so PEN has established the Pre-school Forum to assist and support informal nursery schools in the city centre. Rieneke currently coordinates the 2 PEN preschools as well as the Pre-school Forum outreach to an additional 18 pre-schools in the area. “As we started visiting other nursery schools in the area we were horrified at the lack of resources, qualifications and training at the informal nursery schools and day-mothers that spring up all over the city. As a result we decided to form the Pre-School Forum to assist and support these institutions for the sake of the children in their care,” says Rieneke. The forum provides structural, educational and moral support to informal nursery schools and day-mothers in the city of Tshwane, based on the Asset Based Community Development philosophy. “We support these schools in planning and implementing daily routines and educational programmes for the children. Schools are visited on a regular basis, and we assist them to access resources needed to survive rather than provide them, always striving to avoid dependency. 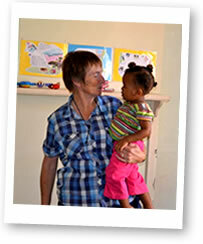 That said, we do share gifts and educational aids when we are blessed by our sponsors,” explains Rieneke. “We also provide basic training workshops once a month for teachers and day-mothers, as well as a popular comprehensive 2 day advanced training workshop run twice a year. Through this forum, instead of reaching 180 children, we are able to reach over 1000 children, many of whom are underprivileged and foreign to South Africa,” says Rieneke. “My main challenges working in the city are to understand and accept the cultural differences between people and find a way to work around and with them. This has forced me to change some of my old, firmly set views and beliefs. Also, my lack of knowledge has forced me to study to equip myself for my work,” she says. For others wishing to change career paths after 50 Rieneke encourages them to consider their life and determine their passion, and then to find an organisation or cause where they feel they can contribute. “Beyond your 50’s is a special time in your life when you don’t have to do what you need to do, but should choose what you want to do and are passionate about. Don’t waste this precious time as working with the less fortunate and building communities is more fulfilling than anything else you could do,” concludes Rieneke.